Welcome to my web site. My name is Mike Ash. 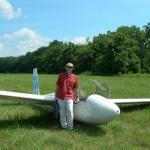 I'm a programmer at Plausible Labs by night, and a glider pilot by day. I'm an alumnus of the University of Wisconsin-Milwaukee and the Université d'Orléans. I currently reside in the Washington, DC area. • My blog - Mac development blog, home of the Friday Q&A series. • My software - Assorted Mac software and code. • Glider flying - All about my adventures with unpowered flight. Please use the menu on the right to explore the site. To contact me, you can e-mail me directly at mike@mikeash.com.